You may have heard that you should never wake a sleeping baby, but that's not always the case. While some newborns will wake up ready to eat without any help, others may be sleepy and need some encouragement. You may find that there are times when you have to wake your baby up for feedings. Your breastfeeding newborn should eat approximately every 2 to 3 hours around the clock. By breastfeeding your baby very often, he will be able to get enough breast milk, and you will be able to stimulate your body to make a healthy breast milk supply. This doesn' t mean that you have to put your child on a breastfeeding schedule; breastfed newborns can eat on demand. However, if your newborn doesn't wake up after 4 hours, you need to go and wake her up. Waking a newborn up to breastfeed isn't always easy. If you find yourself trying to breastfeed a sleepy baby, you may be in for a challenge. Thankfully, there are some things you can try to help make it a little easier. Here are 12 tips for waking your baby up for feedings. Touch Your Baby: Help to ease your child out of her sleepy state by tickling her feet or gently rubbing her arms, legs, and back. Talk to Your Child: Just hearing your voice might be enough to wake your baby. Unwrap Your Baby: You can remove your child's blankets and even undress her so that she isn't so warm and comfortable. However, keep in mind that babies lose body heat very quickly. So, do not keep your child undressed in a cold room. Change the Diaper: The movement and feeling of a diaper change are often enough to get a baby up and ready to eat. Grab a Washcloth: Gently wipe your child's face with a wet washcloth. Try a Bath: The feel of the water and the change in temperature might do the trick. Burp Your Baby: Patting and rubbing your baby's back can help to wake him up. Burping also removes any air trapped in your child's stomach that may be making him feel full or uncomfortable. Dim the Lights: A baby's eyes are sensitive to bright light. Little ones may be more likely to open their eyes and wake up in a darker room. Put the Baby to Your Breast: The natural rooting reflex that your baby is born with may get him eating even if he's sleepy. You can also try to express a few drops of your breast milk onto your baby's mouth. The smell and taste of your breast milk may help to get your baby sucking. Stroke Your Baby's Cheek: If you can get your child latched on but he still isn't eating, stroke his cheek to help get him nursing. Change Breastfeeding Positions: Moving your child to a different breastfeeding position might help to wake her up. Try the side-lying position, football hold, or laid-back nursing position. Avoid Using a Pacifier: Using a pacifier can keep your child quiet and sleeping longer, and it can prevent you from realizing that your baby is hungry. While it's OK for breastfed babies to use a pacifier, it's recommended to wait until the child is approximately 4 to 6 weeks old and breastfeeding is going well before introducing it. 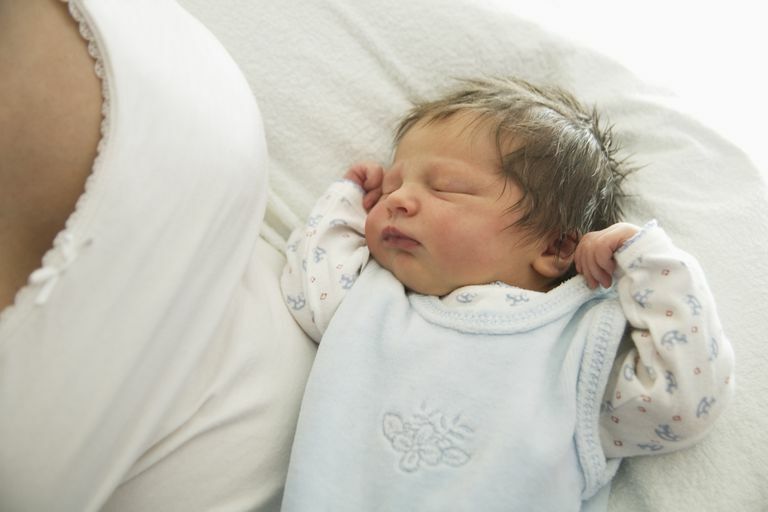 When they're very young, newborns and infants can be sleepy for many reasons, and it's normal for your child to be drowsy for some of his feedings. Just after birth your baby may be tired or still affected by the medications that you were given during your labor and delivery. Plus, some newborns just like to sleep a lot. It's important to wake them up to eat during this early stage of life. As the weeks go on, you will be able to let your child sleep for longer periods of time between feedings. At approximately two weeks of age, your baby may have one long stretch of sleep each day of up to 5 hours, preferably at night, where you don't have to wake her up. Then, after two months your baby will most likely be able to sleep as much as she wants between feedings as long as she is breastfeeding about 8 to 10 times a day and gaining weight well. Infant jaundice, illness, infections, or other issues can cause sleepiness in infants beyond what is normal. If you believe your baby is excessively sleepy, or you're having trouble waking your baby for most feedings, notify your child's pediatrician right away.